Hi, I'm interested in what your opinion is on the experiments done on overarm and underarm fighting that he conducts using re-enactors and volunteers. While I may have complaints about his methods and his use of the artistic record, his results show a huge advantage to using the underarm technique in terms of strength, stamina and accuracy while it displays a huge number of disadvantages to using the overarm technique. Along with that he shows a basic mechanical implausibility of switching grip method within any formation other than widely spaced open order? Hey, thanks for commenting. I am going to do a few posts that will address much of this after I get the grades for my classes in, but I will give you some brief answers. As to his take on over vs underhand, his technique is flawed. I knew this from the description of such strikes. He seems to believe that overhand blows must be descending, but this is a fallacy. Done correctly, overhand strikes can have a flat trajectory or even hit above the level of your own head. What they did was grip the spear shaft too tightly, leading to a stab like you would make with an ice pick. The proper thrust, in my opinion, is far more like the throwing motion. As I will show, all his complaints, from loss of reach to fatigue evaporate when this is done right. Overarm strikes are far more powerful than the high-underhand he advocates, and some of us warned him of this long before he wrote his book. This was shown earlier in a laboratory study by Connelly et al. That he conveniently failed to cite. This coupled with the way his figures misrepresent his "close order" as 45cm, when it is obvious from his own figures that this is more like 60cm, are enough that I would have held up publication if I had reviewed this as a scientific publication. The question of how they switched grip is a red herring, because they never did switch grip. More than one reenactment group has discovered how hoplites lowered their spears from resting on their shoulders directly into an over hand grip. There is some video of the Koryvantes group doing this online. I will post soon and show his fallacious illustrations and how hoplites carried, brandished, and used the dory. Thanks for the response, looking forward to more articles from you. I'd love to see the video if you happen to know where it is, I'm having trouble working out the mechanics in my head and it'd be great to see it in action. Hi. Have you seen the youtube videos of re-enactments? There are two very excellent videos by Thrand, demonstrating the overhand thrust made with a gigging motion. Not just a regular stab thrust, but nearly throwing the spear - but not losing it. This multiplies the penetration power by many orders of magnitude, due to the high acceleration. I think the experiments he has done, in these two videos, is far more convincing than the entire book "Storm of Spears", dedicated to the statistical analysis of artistic depictions. Also, I am certain that the dagger-stab thrust of the overhand approach was rarely used, as it is inefficient. Observe the two videos, and decide for yourself. Thrand has a background in Mixed Martial Arts, jiujitsu, ninjutsu, fencing, etc. I have been commenting on Thrand's thread since he started testing overhand. His rediscovery of what he is calling gigging is an excellent demonstration of why overhand strikes are more powerful than underhand. As I have been writint for years now, overhand engages larger muscle groups and most importantly allows a longer range of motion and time the hand is accelerating the shaft. I think what he is calling gigging is a technique that has been used historically- maybe even by early hoplites with dual-use spears. There are spearmen among the Moros of the Phillipines who look very like hoplites with a long spear and double-grip shield. Their spears are thick near the head and taper towards the tail. I can't see how these are optimized for anything but gigging. That said, I do not believe that classical hoplites used this technique. The dory tapered towards the point and was balanced to about 30% from the rear. If those of us who believe this shape are correct, the spear was ill suited to actual gigging. The closer to the rear you grip a spear the less you gain by letting it slip through the hand. The leather grips on some vase depictions would also speak against this. But the motion and the power are exactly the same whether you release or not- the acceleration ends when the spear and hand disengage. 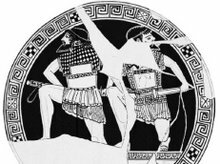 The strike of a hoplite was essentially a throw with the momentum of the spear accounting for most of the force. But in my scheme they did NOT let go of the shaft, though the dory was not gripped tight and it did rotate in the hand to stay on a level trajectory. It amazes me that Christopher Matthews faulty theories and flawed methodology still find support and that here and on sites like RAT, people who are relatively ignorant of the subject make wholly incorrect assertions.In fact so many that one simply doesn't have time to refute them all. Like Paul B. I am another who tried in vain to help Christopher M. before his thesis was published. I won't plunge into the debate - plenty of others can do that. I will take this opportunity to introduce a new facet. It has often been hypothesised that the purpose of the sauroter was to act as a 'counterweight', and that shafts were tapered, both with the object of increasing reach. Yet the vast majority of the iconography shows untapered shafts, and even more significantly, the Dory held around it's mid-point. The 'counterweight' theory falls down completely when you examine actual examples, and realise that they are hollow, not solid ! This of course is consistent with the central grip on an untapered shaft. In fact there are examples of counterweighted 'sauroters', where a weight has been fairly crudely added externally to the sauroter, so some hoplites at least experimented with this. But the point is, this was not the norm, nor typical. Hey Paul, great to see you! I've come to the opinion that the spear varied much more than the shield over the period where we can identify hoplites in iconography. I find it quite possible that they were carrying two spears, at least one for throwing, well into the Archaic period. I do believe that the hoplite was armed with a single doru, or war spear of about 8' long. There is enough evidence from the incidences of "grips" drawn at the bottom third or quarter of the shaft of the spears on vases to make this at least a strong possibility. But as you so often pointed out in the past, there must have been a lot of variation both in time and space. Enough that pinning down everything seen with an aspis on vases to a single weapon type is unlikely. Fred Ray and I have a book going to press next week, "Hoplites at War: A Comprehensive Analysis of Heavy Infantry Combat in the Greek World, 750-100 bce" You figure prominently in the acknowledgments. I finally got a chance to get 40 some hoplite reenactors together to test othismos last fall at Marathon.